asprintf() and vasprintf() are C functions which duplicate the functionality of sprintf() and vsprintf() respectively, except that asprintf() and vasprintf() allocate a string large enough to hold the output, instead of requiring to be supplied with a fixed-length buffer as their predecessors do. ret: A pointer to a char * which will contain the formatted output. format: A format string as with printf() and related functions. Additional arguments: Any extra arguments are used as with sprintf() and vsprintf(). Both functions set *ret to be a pointer to a malloc()'d buffer sufficiently large to hold the formatted string. This pointer should be passed to free() to release the allocated storage when it is no longer needed. The integer value returned by these functions is the number of characters that were output to the newly allocated string (excluding the final '\0'). To put it differently, the return value will match that of strlen(*ret). Upon failure, the returned value will be -1, and *ret will be set to NULL. Note: Upon failure, other implementations may forget to set *ret and leave it in an undefined state. Some other implementations may always set *ret upon failure but forget to assign -1 for the return value in some edge cases. Usage examples are provided with this implementation in the file test.c. 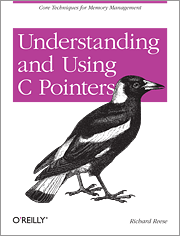 If the topics here interest you, but are currently beyond your skills, acquire for yourself a copy of Understanding and Using C Pointers . If you like this software or anything else on Insane Coding, please consider making a donation.